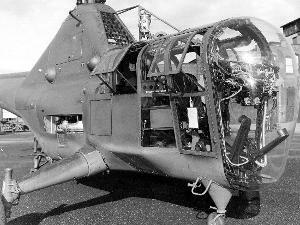 Pioneering helicopter pilot Charles Lester (Les) Morris, a charter member of the AHS, died on October 12, 1991. He was 82. Morris' aviatioin career spanned most of six decades, and included 'firsts' "too numerous to list in detail," according to the forword in Igor Sikorsky's book, 'Pioneering the Helicopter.' Morris learned to fly in 1928, and in 1931 the Connecticut native was appointed the state's Commissioner of Aeronautics - possibly the youngest person ever to head a state government department. He served 10 years, was reappointed twice, and was elected to leadership positioins in the National Association of State Officials, including a term as president. His helicopter career began after leaving the Aeronautics Commission in 1941, when he joined Sikorsky Aircraft as the chief test pilot for the fledgling helicopter program. At Sikorsky, he became the first to master the VS-300 experimental helicopter model, eventually flying the helicopter at 80 miles an hour while retaining full maneuverability - a feat unheard-of at the time. Morris conducted flight tests on the XR-4, which was being built under an Army Air Corps contract, and in 1942 delivered the helicopter to Wright Field, Dayton, Ohio - a cross-country trip of 761 miles in five days, the first flight of its kind in the west, and probably in the world. Morris trained the first group of military helicopter pilots while at Wright Field, and spent much of the rest of World War II test-flying three newly-designed Sikorsky production helicopters. A June, 1943 'Life ' magazine cover photo of Igor Sikorsky also featured Les Mossis hovering the VS-300 over Sikorsky's head. Morris taught Charles Lingbergh to fly the VS-300, and he even helped Helen Keller experience the "relatioinship between the ground and an aircraft in flight," according to an interview he gave in 1978. From 1941-1947, Morris conducted the first test flights on nine different Sikorsky helicopter models, carrying eight of them through to advanced stages of flight. During this time, he laso helped found the AHS, which he served as its second president. He was named an Honorary AHS Fellow in 1971. Morris also was instrumental in organizing the Twirly Birds, the helicopter pioner pilot group. He worked for Kaman Aerospace for 12 years, where he rose to Assistant Vice President. Since 1975, Morris had been a consultant to Sikorsky Aircraft regarding historical documentation. He narrated a popular vidiotape on the history of early helicopter development. A stalwart of the helicopter industry, Morris also found time to serve his community and his church.